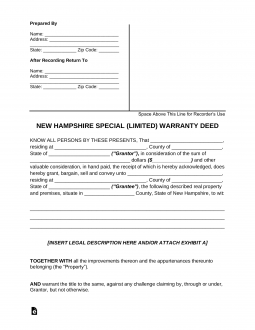 The New Hampshire release deed is used to transfer property in New Hampshire. This type of deed, however, comes with no warranty or guarantee from the grantor as to grantor’s legal authority to sell or as to the title. That means that if any issue comes up with regard to other people claiming an interest in the property, the grantor (seller) is not liable to the buyer for such claims – the buyer is merely buying whatever interests the grantor may have in the property. The seller is “releasing” his or her interest, if any. This type of deed is not typically used in most purchases, but may be used in close situations between family members or entities who already understand the interests being transferred. Step 1 – Write in the name of the grantor and the grantor’s address. Check the box indicating the marital status of grantor. Step 2 – Specify the amount of money being spent to purchase the property. Step 3 – Fill in the name and address of the grantee and check the box indicating ownership status. Step 4 – Include the street address, legal description and recording information of the property. Step 5 – Write in any known encumbrances. Step 6 – Write in the recording information from the previous deed transferring the property. Step 7 – Sign and date as indicated and have the notary witness and sign as well. Step 8 – File with the registry of deeds in the county in which the property is located.